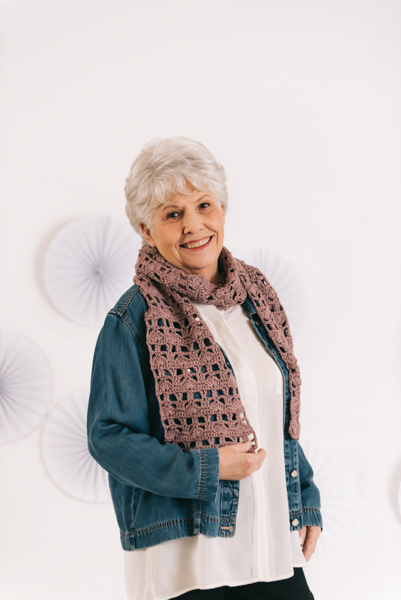 This lacy scarf features a unique combination of shell and v-stitches that are easily repeated over a four-row stitch pattern. Worn with a simple jean jacket, this eye-catching design will be the star of the outfit. V st – (dc, ch 1, dc) in indicated st. Shell – 7 dc in indicated st. 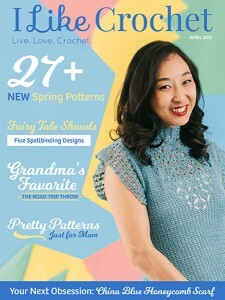 The stitch pattern repeat Rows 2-5. When the desired length is reached, finish off after a Row 2. 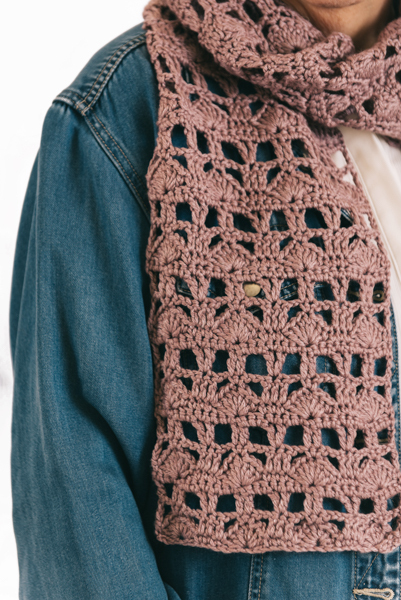 This will make each end of the scarf look the same and give it a more finished look. Row 1: Sc in 2nd ch from hook, *sk next 2 ch, Shell in next ch, sk next 2 ch, sc in next 3 ch; rep from * across, end with sk next 2 ch, sc in last ch – 4 Shells; 11 sc. Row 2: Ch 5 (counts as dc, ch 2), turn, *2 sc in 4th dc of Shell, ch 2, dc in next 3 sc, ch 2; rep from * across, end with ch 2, dc in last sc – 11 dc; 8 sc. Row 3: Ch 5, turn, *dc in next 2 sc, ch 2, V st in 2nd dc of 3-dc group, ch 2; rep from * across, end with ch 2, dc in 3rd ch of beg ch-5 – 3 V st; 10 dc. Row 4: Ch 1, turn, sc in first st, 2 sc in ch-2 sp, *sc2tog over next 2 dc, 2 sc in ch-2 sp, sc in next dc, sc in next ch-1 sp, sc in next dc, 2 sc in ch-2 sp; rep from * across, end with 2 sc in last ch-2 sp, sc in 3rd ch of beg ch-5 – 31 sc. Row 5: Ch 1, turn, sc in first st, *sk next 2 sts, Shell in next st, sk next 2 sts, sc in next 3 sts; rep from * across, end with sk next 2 sts, sc in last st – 4 Shells; 11 sc. 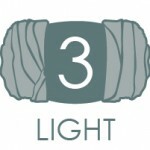 Rep Rows 2-5 to desire length, ending with a Row 2. Weave in loose ends. Blocking really helps bring out the lacey stitch pattern.